Whitetail DeerIs There Actually A Second Rut? After the rut, should you continue to hunt your best rut stands or focus on afternoon feeding patterns? The answer could surprise you. I spent the entire hunting season trying to lay eyes on the giant 8-point buck, and with only two days left in the Illinois archery season it was finally happening. A doe fawn was clearly entering her first estrous cycle and the big boy was right on her heels. With a little luck she would lead him past my stand, situated along a travel corridor between a prime bedding area and a hot food source. The problem was the buck was pestering the doe to the point where she wasn’t really following the well-worn trail past my stand. Instead, she was darting to and fro, heading in the general direction of the food source, but it was in a zigzag pattern through the cover. As the pair closed the distance, I focused my video camera on the spot near my stand where I hoped the buck would pass. I then hit the record button and snapped the release onto the string of my Mathews. As the pair closed the distance, things were looking good until the buck let out a series of grunts and stuck out his nose as he trotted towards the doe. She quickly darted off the trail into the cover near my stand. Luckily the buck stopped 20 yards away and in a perfect spot for me to slip an arrow into his vitals. That’s just what I did, sending him on a death run back towards the heavy cover that helped him stay hidden all season. I watched the buck stumble and drop less than 100 yards away. It was the perfect way to end my season — by punching my second Illinois buck tag. The only thing that had gone wrong was the buck was not within the frame of the video camera when I shot. But that’s how it goes when self-filming. As I walked up to my buck I pondered how close I had come to never laying eyes on him in spite of hunting his core area all season. My trail cameras revealed his presence, but he was a master at staying hidden. The date was Jan. 11 and with the next day being the season’s last, the buck would have likely survived another year and added to his 153-inch rack, if not for that doe fawn coming into heat. Over the next several weeks I shared the details of this hunt with several friends and acquaintances. Their comments showed me many deer hunters misunderstand the intricacies of the whitetail rut and how gullible we can be to accept theories and ideas as fact. “The second rut must have been late this year” and “Would that have been the third rut?” were comments typical of the thoughts shared by several. Is There a Second Rut? I am unsure where the idea of a “second rut” originated. I would guess that an outdoor writer dreamed it up as a way to sell another article, possibly because he witnessed some late-season rutting activity. For years I bought into the idea like everyone else. Each season in mid-December I would once again hunt the same stands with the same passion that I did in mid-November. It never worked. Never! I never saw a buck work a scrape, search for does or trail a hot doe during mid-December when the second rut was supposed to be a mini-version of what I saw in November. Eventually I realized that the idea of a “second rut” was as baseless as some other well-accepted whitetail lore. While it may sound good in theory, I no longer buy into the idea of a second rut, yet many veteran deer hunters continue to talk about the second rut as if it is fact. Make no mistake, there is only one whitetail rut each year. I base this on my experiences over 20-plus years with a captive herd of research whitetails that helped me put the pieces of the puzzle together along with 40 years spent in the whitetail woods. Many of those years I spent the entirety of November and much of the late season in the woods hunting. In a sense, during each of those years when I spent every day of November in the woods I got roughly four times the experience hunting the rut as a hunter who hunts a week in November each season. My time in the whitetail woods during the December and January late seasons has always been substantial as well. Understanding how the whitetail rut truly plays out makes it easy to understand late-rut activity such as I experienced on my January hunt described above. I often compare the whitetail rut to the weather, particularly summer temperatures. Each year the temperatures soar in August similar to the way the rut “heats up” in November. As summer gives way to fall, the average temperatures will cool down with some random periods of warmer-than-normal weather. If we experience a spell of abnormally hot temperatures in October we don’t say we are having a “second summer.” These warm spells are just part of the weather pattern as seasons change. They are never as hot nor do they last as long as the predictable August heat wave, yet they happen at some point almost every fall. The whitetail rut is very similar. In mid-November things reach a fever pitch then start to slowly subside. By the end of the month the rut has cooled down and is not nearly as “hot” as it was a couple of weeks before. There will, however, be flare-ups of intense rut activity later in December and January. These flare-ups are not predictable or widespread, similar to warm temperature we experience in the fall months. The oft-promoted idea of a second rut theorizes that approximately 30 days after the peak of the rut, there will be a less-intense “mini rut.” The story goes that at this specific point any does that did not get bred during their first estrous cycle will again come into heat and many doe fawns will also come into their first heat cycle at this same time. While this may sound logical on paper or in theory, I have two major issues with this idea. First, I am convinced that it is very rare for a whitetail doe to come into estrous and not get bred. Personal experiences have proven to me that a buck can smell an estrous doe from over a mile away. Every buck in the woods is capable of breeding does, including most button bucks. The idea that a doe enters estrous and does not get bred may sound plausible in theory, but I assure you that it rarely happens. Mother Nature knows what she is doing and when a female animal comes into estrous she almost always gets bred. Think of species whose populations are far fewer than whitetails; mountain lions, for example. When a female mountain lion is ready to breed, a male will find, despite the fact that compared to whitetails there are so few of them and their ranges are so large. I assure you, when a whitetail doe is ready to breed there will likely be multiple bucks find her and get the job done. Next, the idea that doe fawns enter estrous based on a date on the calendar is pure fallacy. Doe fawns do typically enter their first estrous after the primary November rut but “when” it happens is based on the doe fawn reaching a specific body weight rather than a date on the calendar. In fact, from what I have seen in my experiences in the whitetail woods and with my captive herd of research whitetails, a doe fawn is more likely to enter her first estrous cycle in January than December. A perfect example is the hunt described at the beginning of this article, but I have seen it numerous other times. In a nutshell, the timing of doe fawns entering their first estrous cycle is completely random. Rut activity outside the November peak does indeed happen and it can be intense. We cannot, however, predict exactly when it will happen. It's like trying to predict a date next fall when we will experience an abnormally warm period. Simply put, rut activity outside of the November peak is real but it is sporadic and impossible to predict. When it does happen, the action is likely to be intense. A hot doe in the late season is likely to have several bucks following close on her tail as she is likely to be the only doe in heat to garner their attention at the time. Trying to take advantage of late rut activity as a hunter can be a tough proposition. It's hit or miss, with a lot more misses than hits. To be honest, the buck I described killing at the beginning of this article is the only buck I have ever taken that was actively “rutting” after November in spite of the fact that I have diligently hunted the late seasons for decades. Don’t misunderstand, I have seen other late rut activity over the years but this is the only time I was able to actually put the buck on the ground. In my opinion, after the November rut a late-season hunter is best advised to simply hunt afternoon feeding patterns as deer move from bedding cover towards prime food sources. In the rare event that a doe is in estrous she will likely not abandon this travel pattern and will have a buck or, more likely, several bucks, in tow. Remember, this late-rut action will be intense, but it will be short-lived and unpredictable just like a late fall spell of hot weather. And the next time one of your hunting buddies starts talking about the second rut, you can educate him to the fact that there is only one whitetail rut each season. 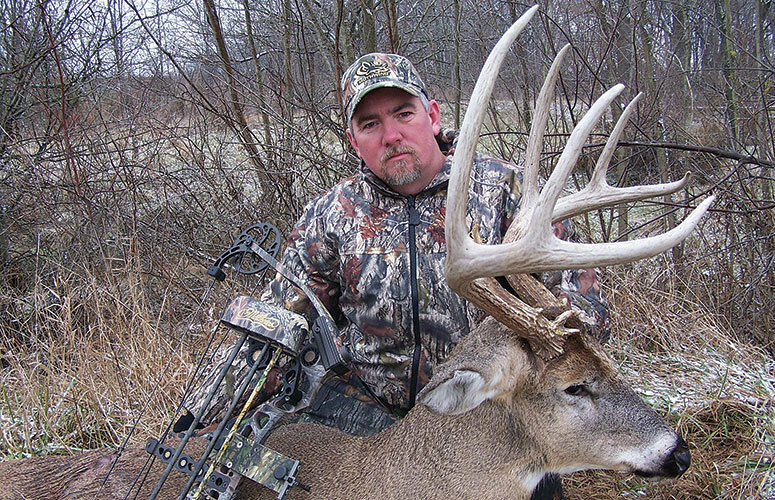 Editor’s note: Don Higgins lives in Illinois, hunts in the Midwest and has authored two books on hunting trophy whitetail bucks. He also owns and operates Higgins Outdoors Inc., a multi-faceted wildlife habitat-based company. For more info see www.higginsoutdoors.com.